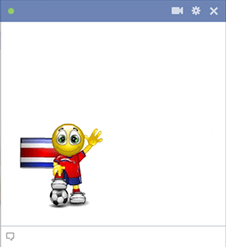 Celebrate each goal when you post this emoticon to your FB timeline. Cheer for your favorite team and inspire your friends to post emoticons too. You can ramp up the excitement on game day when you post these images, which are so fun and colorful. Inspire Costa Rica to victory!